Winner365 casino is a new online gambling site for 2018 and offers a range of great games including live dealer tables. The site is owned by Game Tech Group N.V. and offers some amazing bonuses for new and returning players. All new players who sign up for an account can claim a first deposit bonus of 400% up to $800. If you want a bigger bonus than that, you can get in touch with the support team who will tell you all about the high roller bonus offer that is available. New players also get a second deposit bonus which is 150% up to $1,000 which is fantastic. That's not all, there's also a weekly 100% bonus up to $300 available every Sunday for four weeks. That's a massive $3,000 in bonuses for new players who sign up for an account at Casino Winner365. As with all bonus offers, there are wagering requirements at these are 20x your deposit and bonus before you can make a withdrawal. Players from certain countries are required to wager 40x, but for Canadian players, it's only 20x which is great. There are no bonus codes required to claim the welcome package. Returning players can also enjoy great promotions and if you prefer to play on your mobile device you can contact the support team for information on special mobile bonuses that are available. Winner365 Casino also has a VIP club that offers exclusive promotions and members get great benefits including personal account managers, special promotions, no deposit bonuses, free spins, and special prizes. They also get faster withdrawals and a higher comp point conversion rate. When compared with Enzo Casino who offer 150% up to $1,500, Winner365 Casino seems to offer a better deal. Their wagering requirements are excellent too and we're sure like Enzo Casino they will have special no deposit bonus offers available to those with special coupon codes too, once they firmly establish themselves. Casino Winner365 is still relatively new and while a large number of countries are restricted as well as certain developers, it remains a great choice for online gambling in Canada. Canadian players will find lots of great benefits including excellent customer support, English and French software, and the ability to play in Canadian dollars. We will be keeping an eye on things to fully assess country popularity once the casino has been live for at least six months or more. Casino Winner365 offers some great casino games from software providers such as Betsoft, BG, Booongo, Felix Gaming, Fugaso, GameART, GameScale, LuckyStreak, MrSlotty, Play'n Go, Playson and Spinomenal. This means that players will find a huge range of old and new titles to enjoy. For those who are fans of NetEnt slots, this software provider is due to be added soon. The site's primary language is English and there is no download required to play the games as everything is available in instant play through your browser. The casino is fully mobile compatible also and is available on iPhone, iPad, and Android smartphones and tablets with no app required. All the games run in your browser. Players will find a range of slots, video poker, table games, scratch cards, and more. Table games fan will a great range including roulette, blackjack, baccarat, and more. There are tables with different limits and plenty of variants too. There's also a live casino for those who wish to play with a live dealer and experience the thrill of a real brick and mortar establishment. Popular table games including Roulette Pro, Wild Sevens, Mini Baccarat, Casino Hold'em, Caribbean Poker, Blackjack Switch, European roulette, Deuces Wild, Pai Gow, and more. Slots fans will find some of the best games around. This includes titles like Fire and Steel, Happy Jungle, Down the PUB, Draculas Family, The SlotFather, Crazy Pizza, Blood Eternal, 2 Million BC, and many more. You can win some great jackpot prizes too and many of the video slots come with excellent bonus features too. 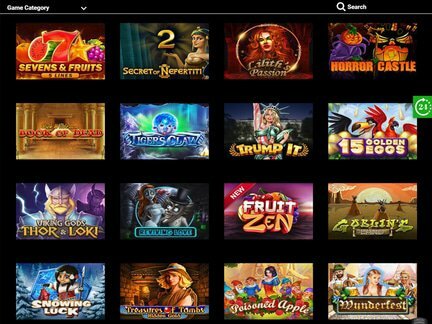 The most popular slots category includes Legend of Cleopatra, Kingdom of the Sun, Pharaoh's Temple, A Night in Paris, Grand Sumo, Gold Diggers, and Light Dance. As Winner365 casino is brand new, there haven't been any big winners yet. Progressive jackpots are really popular at online gambling sites because they offer players the chance to win life-changing sums of money with a lucky spin of the reels. There are 34 different progressive jackpot slots games available at casino Winner365 including At The Copa and Good Girl Bad Girl from Betsoft. Betsoft progressives won't net you nearly as much as the likes of Microgaming or NetEnt and the highest jackpot win from a Betsoft progressive slot was back in June 2016 when a lucky player at Bovada casino won $153,803 playing Bad Girl. Players can also enjoy a range of other lesser known progressive jackpot titles such as Book of Tattoo, Cosa Nostra, Sunset Wild, Carousel, The Giant, and more. There is no winner information provided on the website. As Casino Winner365 has only just launched, there are no complaints to report. We will be keeping a close eye on this in the coming months and will update this section accordingly. As such we have given Winner365 a five out of five rating and will adjust this if necessary after the site has been live for at least six months and we can assess any complaints that have been made. Winner365 Casino launched in March 2018 and is owned and operated by Game Tech Group N.V. The site is licensed and regulated by the Government of Curacao. The site uses encryption technology to ensure that player data and financial information is kept safe and secure. They also promise fair gaming and state that the RNG is audited and tested by a third party. The return to player percentages for the casino are not listed publicly. A lot of the slots games list their RTP percentages in the game information so players can check this before playing. I found playing at Winner365 Casino to be a very enjoyable experience. The games were available to play on both desktop and mobile and I tried them on my iPhone and iPad. There was no download or app required and all the games opened instantly in my browser. On mobile devices, the slots adjusted to suit the size of my screen and all I had to do was tap to spin the reels. The welcome bonus was easy to claim and there was no coupon or voucher code needed. 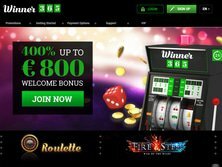 There weren't any free spins or no deposit bonus which is a shame, but the low wagering requirements more than made up for this as well as the fact that the welcome package was spread out over a number of deposits. The website itself was very easy to navigate and the VIP program is great. One thing I would like to see is more promotions and I expect that this section will be updated very quickly as more and more players sign up. The minimum deposit amount is just $10 and there are plenty of payment methods to choose from including debit and credit cards and popular e-wallets such as Neteller, Skrill, and more. Support is available 24/7 via live chat and they are really friendly and may even provide players with vouchers for further casino rewards. All in all, I had a great time playing at Winner365 casino and even though they don't offer a no deposit bonus, it was worth signing up for real money account and making a deposit because of the low wagering requirements.